The Bosnian capital was chosen for the event — ahead of Ankara’s presidential and parliamentary elections next month — after European Union states such as Germany, Austria and the Netherlands barred Turkish politicians from electioneering in their countries, stoking tensions between Ankara and Brussels. Turkey is scheduled to go the polls on 24 June, with three million expatriate Turks allowed to vote, including 1.4 million in Germany. Several thousand people, according to an AFP reporter, converged on Sarajevo’s largest sports venue, Zetra, where the rally was held. 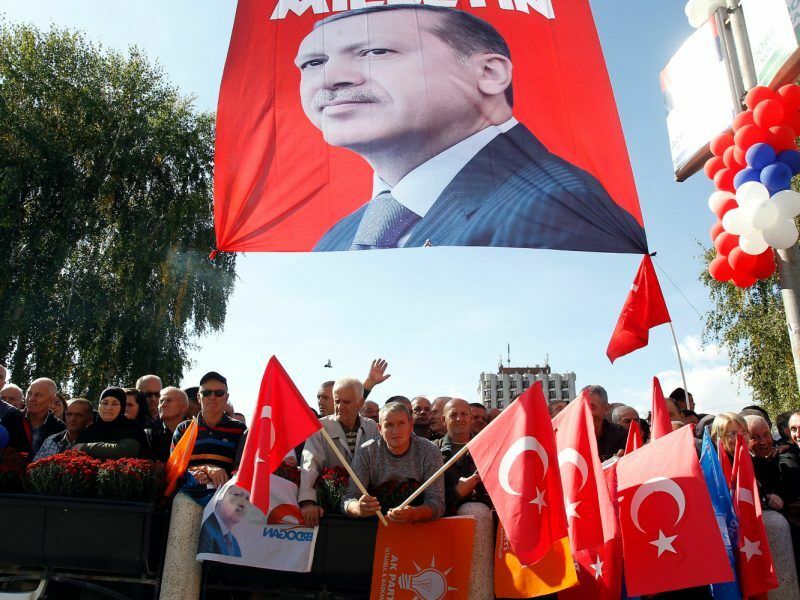 Many of the participants, who arrived from several European countries, including Germany, Austria, Denmark and France, were wearing scarves and banners carrying pictures of the Turkish leader, and waving Turkish flags. Giant billboards welcomed Erdoğan in Turkish and Bosnian. Security for the event, the only one Erdoğan will attend outside Turkey, was tight. 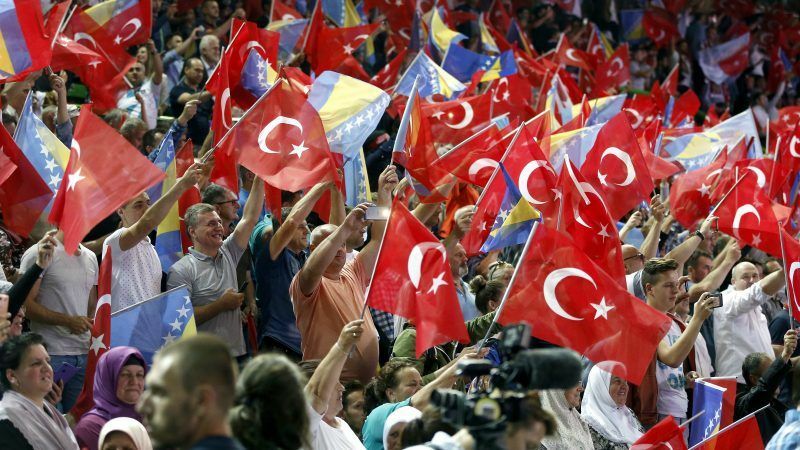 Despite the ban in other European countries, Bosnia had not been expected to stop Turkish politicians campaigning on its soil, given the close ties between Bosnian Muslim leader Bakir Izetbegovic and his SDA party and Erdoğan’s ruling Justice and Development Party (AKP). According to Bosnian media, the AKP is also planning to open a representative office in Bosnia soon. “Allahu akbar” (God is greatest) and “Sultan Erdoğan” the crowd chanted as Erdoğan arrived accompanied by Izetbegovic. Erdoğan urged Turkish diaspora to get involved in the politics of their adopted countries and take citizenship. “I have one request from you, take an active role in the political parties in the countries you live (in),” he told the crowd during a nearly hour-long speech. Host Izetbegovic, who is also the Muslim member of Bosnia’s tripartite presidency, urged the crowd to vote for Erdoğan labelling him a “man God sent to you”. Nevertheless, Erdoğan’s visit stirred controversy in Bosnia and support for it was not unanimous. “Why hold a rally in Bosnia rather than in Turkey. Of course, I mind,” pensioner Spomenka Beus, 74, told AFP. However, Muhamed Yanik, a 20-year-old student, said he had travelled 28 hours by bus from Germany to see Erdoğan. “If he says so, we will die for him,” Yanik said. But others, such as theatre director Dino Mustafic, felt Erdoğan’s visit harked back to the colonial times of the Ottoman Empire, when the Balkans, notably Bosnia, were ruled by the Ottomans for more than four centuries until 1878. The event would be an occasion for “poor local people to euphorically applaud their sultan,” he tweeted. Bosnian Serb leader Milord Dodik accused the Turkish leader of “interfering” in Bosnia’s affairs. But Erdoğan said Turkey had “no hidden agenda”. Turkey has excellent relations with Bosnia and Turkish companies have played a major role in the country’s reconstruction following its 1990s inter-ethnic war. Erdoğan has called snap presidential and parliamentary elections for June 24, bringing the polls forward by a year-and a half. Half of Bosnia’s 3.5 million citizens are Muslims, a third are Serbs, while Croats make some 15% of the population. The expatriate European vote is generally a source of support for Erdoğan’s AKP and officials are keen to rouse a strong turnout in Europe. 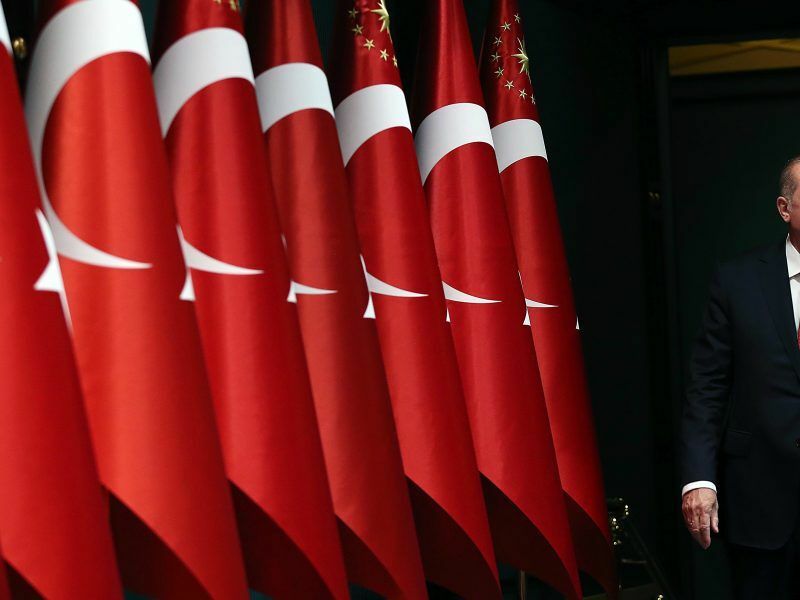 The early election in Turkey is set to accelerate its transition to the new presidential system with full executive powers which critics fear will lead to a one-man rule. well the EU wanted a Macedonian state…why not a small Turkmenistan? This could be assimilated like they do it in Germany….